The Boundless Thicket: Alcohol a Cause for Cancer?? Asian Glow, a Sign of Intoxication or a Cause for Cancer? When I was browsing facebook one day, I received a notification from my friend Jeff. He had linked something to my profile. The title of the article read “The Body Odd – ‘Asian flush’ red flag for risk of cancer.” Being of Asian descent and a person who suffers from “asian glow” when consuming alcohol, I was intrigued by this article but initially thought it was a hoax that my friends wanted me to believe. The article posted on msnbc.com stated that people who are deficient in a specific gene linked to a liver enzyme are ten times more likely to develop esophageal cancer compared to a person who can metabolize alcohol properly. The “Asian Glow” is caused by an inability to metabolize alcohol completely due to a deficiency in a gene for alcohol dehydrogenase 2(ALDH2) enzyme. This deficiency leads to alcohol being broken down partially to acetaldehyde which is a known carcinogen as opposed to the harmless acetate end product. Finishing the article, I was still skeptical so I looked up alcohol metabolism on Wikipedia to enhance my general understanding. Alcohol when consumed is broken down in the body using two enzymes, alcohol dehydrogenase and acetaldehyde dehydrogenase to form acetate, a nontoxic compound. Alcohol dehydrogenase oxidizes ethanol: CH3CH2OH + NAD+ → CH3CHO + NADH + H+ in order to produce acetaldehyde within the body. 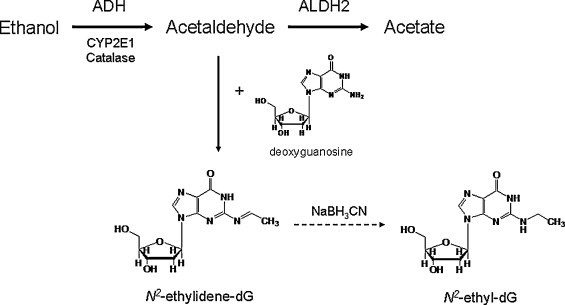 Acetaldehyde dehydrogenase catalyzes the reaction of CH3CHO + NAD+ + CoA → acetyl-CoA + NADH + H+. 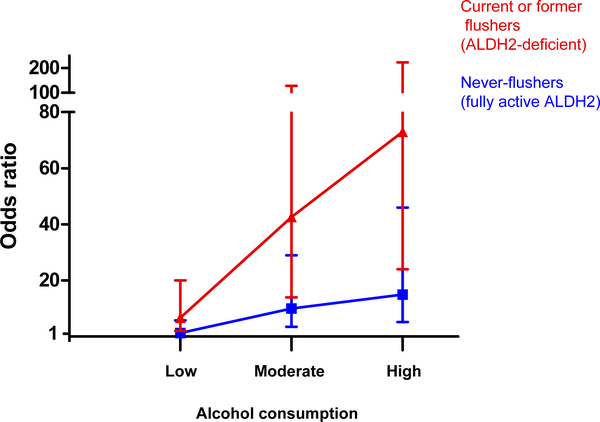 Data from the study provided information on the genetic alteration between wild and mutant phenotypes of alcohol dehydrogenase. ALDH2 codes for the protein that breaks down alcohol, but mutations at position 487 from glutamine(Gly) to lysine(Lys) leads to a partially functional protein. Proteins that are Glu/Glu homozygotes retain full protein activity, while Glu/Lys heterozygotes have partial function and Lys/Lys homozygotes lose all function. Glu/Lys heterozygotes develop a tolerance to acetaldehyde, leading to a higher risk of developing cancer with an odds ratio ranging from 3.7-18.1. This higher risk is due to the gradual resistance to acetaldehyde effects on the body such as flushing and increased heart rate while the carcinogenic effects remain. The data from Figure 1 details the odds ratio of esophageal cancer at different alcohol consumption levels per week. Low intake constituted 1-8.9 units, moderate 9-17.9 units, and high was greater than 18 units. Each unit is equivalent to 22 g of ethanol. The odds ratio increases accordingly from about 8 to 40 to almost 80, showing that cancer risks increase drastically with alcohol consumption rates. On the other hand though, the journal article did not explain what the odds ratio equivocated to in relation to cancer development besides a general correlation. The presence of acetaldehyde led to DNA damage in white blood cells and concentrations of acetaldehyde being 10-20 times higher in saliva than blood, which correlated to esophageal cancer risks being raised. After reading the article, I felt dissatisfied with the incomplete data and results which were unclear. I began wondering how exactly acetaldehyde creates such damaging effects on the body. 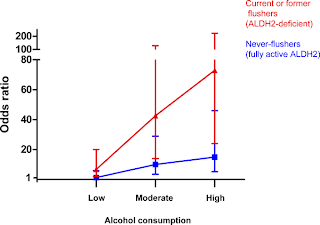 Through a Pubmed search, I found an article describing the effects of acetaldehyde produced from drinking called “Formation of Acetaldehyde-derived DNA adductsdue to alcohol exposure” by Hsu-Sheng Yu et al. The article explained how acetaldehyde affects deoxyadenonsine and deoxycytidine but has a higher specificity for deoxyguanosine. The major adduct that forms from deoxyguanosine covalently bonding with acetaldehyde is N2-ethylidene-2′-deoxyguanosine (N2-ethylidene-dG), which was measured by detecting N2-ethyl-2′-deoxyguanosine (N2-ethyl-dG) following reduction of N2-ethylidene-dG by sodium cyanoborohydride (Figure 2). The increase in DNA adducts lead to a higher frequency of DNA-protein or DNA-DNA cross-linking, inhibiting processes such as replication, transcription, and recombination. Also tumor suppressors can be inactivated along with proto-oncogenes activation in the presence of DNA adducts. Additionally, chronic alcohol consumption induces the expression of CYP2E1, which creates reactive oxygen species such as superoxide (O2−), hydrogen peroxide (H2O2), and hydroxyl radicals (OH). These oxygen species react negatively by causing oxidative damage to proteins, nucleic acids, and lipids. Reading about the problems that ALDH2 deficiency creates led me to googling the acetaldehyde and I found a website describing “How Hangovers Work” on howstuffworks.com. The webpage described that acetaldehyde is targeted by glutathione, a cysteine rich substance, and acetaldehyde dehydrogenase to form acetate. This got me thinking that maybe an additive or enzyme could be given through a food supplement or a drug to someone who is deficient in acetaldehyde dehydrogenase in order to facilitate the breakdown of acetaldehyde. Following my idea, I began searching for journal articles related to acetaldehyde and its toxicity. I went to Pubmed.com to search for articles and initially returned one called “Eliminating carcinogenic acetaldehyde by cysteine from saliva during smoking” written by Ville J. Salaspuro et al. L-cysteine reacts covalently with acetaldehyde in saliva to form stable 2-methylthiazolidine-4-carboxylic acid (Figure 3). The method used to collect the data required participants to take a tablet of cysteine then smoke a cigarette. Saliva samples were taken from each participant before smoking, then at 5 minute intervals after smoking the cigarette. The results of the experiment show that smoking raised acetaldehyde levels to 91-352µmol/L in saliva and that 5mg was cysteine significantly lowered acetaldehyde levels. This article proved to me that acetaldehyde can be oxidized to a non-toxic form using cysteine, however I wanted to find a way to remove acetaldehyde in the bloodstream and in the digestive system. Continued searching for articles on Pubmed about using cysteine as a possible solution to reduce acetaldehyde concentrations resulted in an article written by Klas Linderborg called “Reducing carcinogenic acetaldehyde in the achlorhydricstomach with cysteine.” The study examined concentrations of cysteine and acetaldehyde in the stomach following ingestion of select concentrations of cyteine and ethanol. L-cysteine was formed into granules in order to prevent rapid dissolving and administered through capsules. Samples were taken from participants using a nasogastric tube and measured using high pressure liquid chromatography to measure cysteine concentrations and perchloric acid to measure non-bonded acetaldehyde. Results showed that cysteine greatly decreased the amount of acetaldehyde in the stomach by 2.6 times compared to the placebos that were administered as a control (Figure 4). The use of slow release cysteine was successful with the capsulated granules, and was present in the stomach after 40 minutes following ingestion. From the results of the last two articles regarding cysteine to reduce the concentrations of acetaldehyde, I believe that the negative cancer inducing effects alcohol has on the people who are ALDH2 deficient can be treated by using cysteine to covalently bond with acetaldehyde. Although, the solution is not a cure to eliminating all the acetaldehyde in the body when consuming ethanol, cysteine is still an option in at least lowering the concentrations of acetaldehyde that can damage DNA and possibly cause cancer. For many, a pill is not an ideal source to increase cysteine in a body system, there are other natural ways to increase the intake of cysteine. According to wikipedia, foods that contain natural cysteine include most high protein foods such as eggs, pork, chicken, turkey, milk, yogurt, whey protein. Cysteine is even found in broccoli, onions, brussels sprouts, red peppers, and granola. However, the amount of cysteine in each food varies and could alter the effects of cysteine reacting with acetaldehyde. Extensive research of this topic has shown me that people who have a deficient ALDH2 gene suffer from an inefficient acetaldehyde dehydrogenase enzyme. 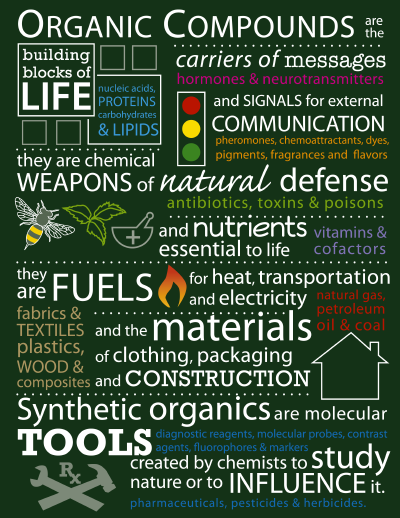 Thus, DNA adducts form along with reactive oxygen species, causing damage to DNA and other cellular molecules. However, cysteine was found to be a suitable metabolite to reduce the amount of acetaldehyde in saliva and the stomach. Slow releasing cysteine was found to be fully active within the stomach for up to 40 minutes reacting with acetaldehyde following ingestion, showing that cysteine can be an effective treatment to reduce cancer inducing acetaldehyde. 1. Mapes, Diane. "'Asian Flush' a red flag for risk of cancer." MSNBC.com Dec. 28 2011. Web Jan. 8 2012. 2. Brooks, Phillip, et al. "The Alcohol Flushing Response: An Unrecognized risk Factor for Esophageal Cancer from Alcohol Consumption.” PLoS Medicine. Mar. 24 2009. Web. Feb 16 2012. 3. Yu, Hsu-Sheng, et al. “Formation of acetaldehyde-derived DNA Adducts due to alcohol Exposure.” Sciencedirect.com. Aug. 31 2010. Web. Mar. 2 2012. 4. Perry, Lance. “How Hangovers Work.” HowStuffWorks.com. Web. Feb 21 2012. 5. Salaspuro, Ville J, et al. “Elimination Carcinogenic Acetaldehyde By Cysteine From Saliva During Smoking.” Jan. 24 2006. Web. Mar. 2 2012. 6. Linderborg, Klas, et al. “Reducing Carcinogenic Acetaldehyde Exposure in the achlorhydric Stomach with Cysteine.” Dec. 8 2010. Web. Mar. 2 2012.